A cool breeze with the moon radiantly shining behind the curtain of clouds set the right mood to treat the tastebuds with a sumptuous dinner. So, the natural choice was to head towards the ongoing Awadhi Food Festival at Courtyard Marriott in Sushant Lok, Gurgaon. The plush interiors failed to grab my attention because there was nothing on my mind but- FOOD!! I was cordially greeted by the staff who were dressed in gold and silver anarkalis (which was more mughlai than the Awadhi angarkhas) but nontheless the warm hospitality made up for that. The decor was colourful and splendid with multi-coloured embroidered umbrellas and punkahs hanging from the ceiling. The aroma was overwhelming and my mouth was already salivating with each breath but patiently waiting for Chef Amit de rigeur. Thankfully, I didn’t have to wait much and Chef Amit with his smiling face was right there. I preferred to take a tour of the buffet and then later decide on what would I choose to have on my platter. But first Chef Amit made a point that the ongoing festival would serve around 100 different dishes spread across 12 days till October 15th! Whoa!! That was indeed impressive. 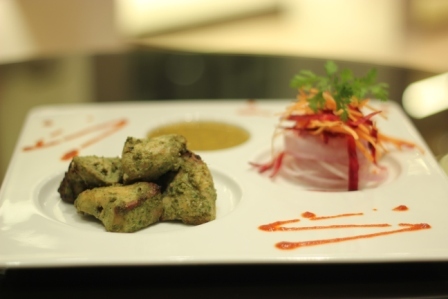 The hors d’ouevre for that night’s Awadhi dastarkhwan had something for both vegetarians as well as non-veg lovers. Harey Matar ki Tikki was a pleasant aberration from the usual aaloo cutlets, while Reshami Kebabs were our very own Shami Kebabs with a fancy name and there were also Kali Mirch ke chote Aaloo and Chicken Shikampori. There were also two kinds of soups namely, Kaddu ka Shorba and Macchi Tamatar Shorba. Chef Amit wasted no time in cruising us through the main course which had some delightful delicacies. Many known to me already but some that I chanced upon for the very first time. There was Keema Kaleji ka, Nargisi Kofte, Subz Anjeer ke Kofte, Chicken Kali Mirch, Laung Bahaar ki Machchli, Nahari and of course, the Dumpukht Biryani along with its vegetarian variant. “I have learned the nitty-gritties of Awadhi cuisine from my guru Shri Imtiaz Qureshi Saab. Obviously I have kept in mind that people have become very health conscious these days and therefore I haven’t added desi ghee in abundance but yes, the Awadhi flavours are intact,” quips Chef Amit Dash. With my mouth already drooling, I couldn’t wait an iota of a second to dig into the Awadhi dastarkhwan. The appetizers on my platter were Harey Matar ki Tikki, Chicken Shikampori, Reshami Kebab and Kali Mirch ke Chote Aaloo. I chose to start with the veg snacks as being a die-hard fan of non-veg, I wanted the taste of the kebabs to linger on. Kali Mirch ke Chote Aaloo were appropriately cooked with the skin intact. You could either bite into it or just pop the entire aaloo at one go. I chose the latter so that the black pepper and the mild spices came as a whole along with the taste of potato. The Harey Matar Ki Tikki surprisingly wowed me. The green peas were smoothly mashed into a patty that were crispy on the outside and were fried exactly how a tikki should ideally be- golden brown on the outside that enters the palette of your mouth with a crunch. Chicken Shikampori was the usual chicken seekh kebab. The spices were mild but coupled with the green chutney, it did indeed makes you yearn for another piece. However, the Reshami Kebab failed to impress me. The minced meat wasn’t juicy and I had to replace the first kebab which was overcooked on one side. The second that came was undercooked and broke while taking onto my plate. I had to go back to Harey Matar Ki Tikki so that its flavourful taste lingered for a while. Moving on to the next course, I chose Subz Anjeer ke Kofte, Chicken Kali Mirch and Nargisi Kofte. I had never heard nor had Anjeer ke kofte on an Awadhi Dastarkhwan. But the mild spices and the subtle sweetness of Anjeer (figs) with its grainy texture indeed was a delight for a vegetarian food lover. Chicken Kali Mirch too had a mild gravy but the chicken was soft and tender. With every bite the strong aroma of black pepper engulfed the senses and there was a subtle taste of the dry fruit paste that added the Awadhi royalty to the food. However, the queen of the platter title would go to Nargisi Kofte. The minced meat had absorbed the garam masala and covering the boiled egg, it indeed enamoured the senses. The minced meat was succulent, just how I prefer my koftas (I simply abhor dry koftas) and the cinnamon, nutmeg and other spices blended exotically in the gravy as well as the minced meat. I wanted to have more of it, but also had to save room for the ultimate Awadhi Biryani which Chef Amit had prepared in the typical Awadhi style in which the rice and the gravy with the meat is alternately placed in layers and then kept on ‘dum’, hence called Dumpukht. For me the biryani was a litmus test of Awadhi cuisine and I was immensely gratified to find the flavours intact and the chicken and the rice were not broken. The ‘dum’ style of cooking allows the rice to absorb the juices of the meat and the spices so that with every bite, one feels the aroma and flavour of spices, unlike other variants in which one only gets the flavour of the biryani on eating the meat while the rice remains untouched by it. But Chef Amit had indeed done a great job in bringing out the authentic taste from the kitchens of Awadh. The Biryani tempted me to have another helping with my hand but again my urban dining ettiquette held me back. I was full to the brim but the tempting Thande Gulab Ki Kheer and Chef’s special, Nizam Ki Nazaakat was eagerly awaited to satiate my sweet tooth. The Kheer had fresh desi gulab petals and what I loved the most was unlike the usual gulab kheer. 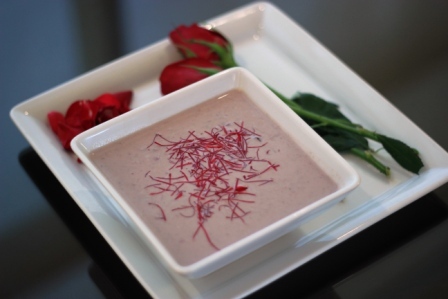 The petals were shredded and were not overpowering the taste of the kheer (which happens when whole rose petals are added). The consistency was apt, neither too thick like a pudding nor very watery. Without much ado, I moved on to the Chef’s special- Nizam Ki Nazaakat. I must admit, I was enamoured with the very first bite. The liquified rabri worked amazingly well with the mini gulab jamuns and boondis that floated lazingly. It had a silky touch to it and the gulab jamuns in every bite left me yearning for more. Though I believe that a dash of almond flakes would have brought it a level higher, but of course, not everyone is as reckless about one’s health as I when it comes to food! And Chef Amit rightly knows that. So all you foodies out there, make sure to mark a day on your calendar to visit the Awadhi Food Festival at Courtyard Marriott to indulge yourself in Royalty!